In today’s more competitive business world, having a site that looks professional is essential, though it’s worth remembering an expensive design could still look cheap. It all depends on the approach of your designer and putting together details to resonate with the viewer. While “professional” can mean a lot of things, don’t discount the idea that you can’t create a professional website within reasonable budget guidelines. In some cases, you can create quality template designs, even if you’re still using a custom design plan. However, most of what makes a website look more professional are details you may think no one initially notices. Many subtle aspects to design affect how a user perceives you when visiting for the first time. Some of these elements include what type of font you use, what photos you post, and your color scheme as just starters. Here’s how to avoid making your web design look cheap by looking at the nuances of these essential design elements. While you may realize overly wild fonts don’t denote professionalism, it’s still important to think about what typography you’ll use. Many have already long written off comic sans as being the worst indicator of looking cheap. Even so, other fonts could equally look amateur, which could pose a problem if you get critical feedback from visitors. Many luxury brands spend a fortune to create unique typography to make themselves look more appealing. It isn’t necessary to spend exorbitant amounts of money to create good fonts. Take some time to study which text style best represents your brand by visiting Google Fonts. They have hundreds available for free to give you a type best fitting your message so your typography doesn’t look slipshod. Yes, there is such a thing as clichés in stock photos if you decide to use this type of photography. It’s better to avoid stock photos completely if you can, though you can sometimes find unique ones not using overly common images. Stay away from cliché shots like “words on a keyboard” or people with overdone facial expressions. Your best approach is to find little-known photographers online who want to get their work exposed. Offer to use their standout photos in exchange for promoting them. As a symbiotic process, you can save money and still get photos not found anywhere else. No doubt you’ve already read plenty about the psychology of color, though it doesn’t always help in matching a color that best fits your company. You need some time to choose a color scheme best fitting your unique brand rather than automatically going for overly bright and basic colors. Where do I get color pallets? I have some interesting color pallets saved on my Pinterest color board. And when these don’t fit a client’s pallet, I visit Adobe’s website where they have a color wheel helping develop color mixtures best representing you. Picking colors that are easy on the eyes and bringing an inviting feel for your brand proves you’re not rushing things just to get your site up live. I recently just discovered an excellent color resource put together by Canva. Their Color Wiki teaches you everything you need to know about colors, their meanings and the color combinations that will hopefully give inspiration to your next design! 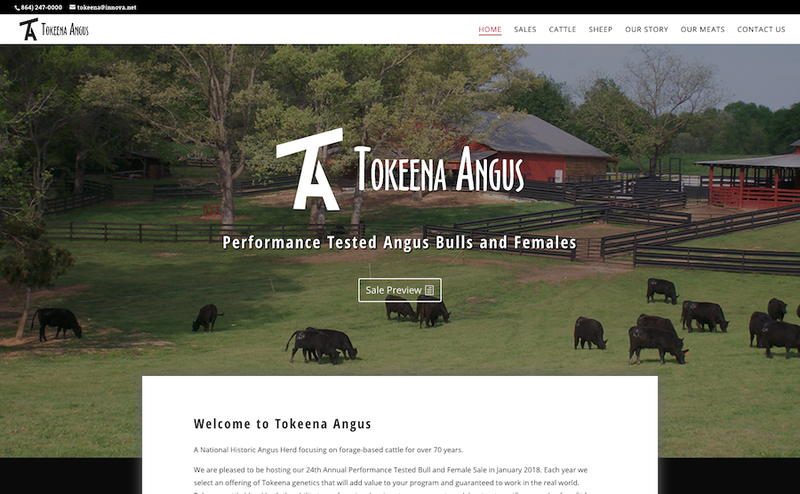 Here is a current example of a website re-design we are working on for Tokeena Angus in South Carolina. 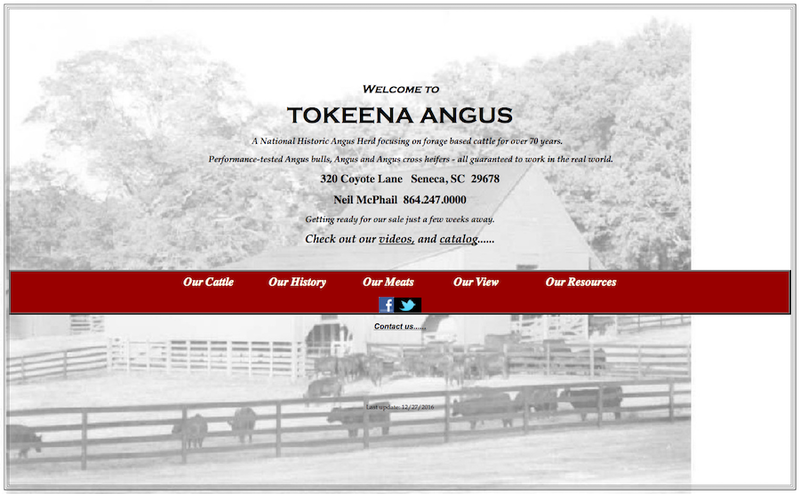 The fonts used in the old site were outdated and didn’t represent the history and integrity of this long standing farming operation. Although there were a few other issues with the old site, by simply updating the layout, photos, color and font, we are able to give them a fresh, professional new website. The key to making your website look more professional is paying attention to the details. Remember when you rush or don’t take the time to plan a strategy is often when a website can look cheap. At the end of the day, your website is for your visitors, so always factor them into your decisions when it comes to designing your website.